I never know what to expect at our weekly demonstrations. It’s hard to judge what could happen. The DWP system makes life chaotic for claimants so we work around that. We gave our food parcels out in record time again. Many thanks to Pauline for this. 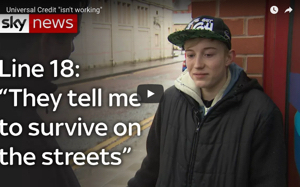 They have become a lifeline for claimants. We had good news from one of the claimants who was on our video that we made with the guardian. Not Melvin sadly, but another chap. At last he’s had his first ESA payment and he can now eat. What a feeling that must be. I can bet he is in a state of shock. He told me that he will pay our kindness forward. How fantastic is that. I hope that it won’t be too long before he is offered somewhere permanent to live. We had coffee and cake sent over from a local cafe. I thought that was amazing and it certainly lifted our spirits. It’s getting cold now and it reminded me that I need to invest in a new flask. Unfortunately some things never change, although I wish that they would. We had the not so unusual comment that the problem all lies with so called foreigners taking away money from others. We will not stand for such comments, so we told them that they were misinformed and they should go on their way. Very sad that people still believe the Murdoch led press and awful TV programmes made to pitch neighbour against neighbour. It’s awful but its going to take alot to change the mindset of some people. It breaks my heart that many claimants having to attend the Jobcentre are so thin, look weak and so downtrodden. It’s awful. We do our best to help them. There’s not much more that we can do. We do signpost claimants and the food parcels help. We are certainly not a third world country but the government treats the poorest like it is. Condemning them to a life of extreme poverty. Many claimants die in the winter because they can’t afford to heat and eat. This is inhumane. And unforgivable. I certainly don’t think that anyone in the opposition government is putting this as a priority. Sanctions do lead to death and extreme malnutrition and it must be tackled as a matter of urgent propriety. It can happen to anyone and we need to remember this. 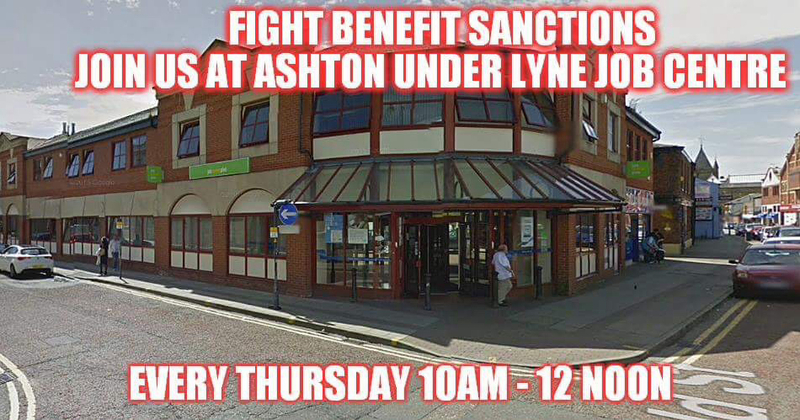 It came to light today that some members of staff at Ashton Under Lyne Jobcentre don’t like us helping claimants outside the Jobcentre every Thursday. Apparently it puts them “In a bad mood”. Well I’m sorry but if claimants were actually treated like intelligent human beings, if they were given all the help that they needed, if they were allowed to telephone different departments from inside the Jobcentre, if they were allowed to wait inside the Jobcentre if they are ten minutes early instead of being turned away, if they weren’t sanctioned for very petty and unreasonable reasons, if attitudes of some members of staff weren’t condesnding then we really wouldn’t have to be there would we. For the decent memebers of staff still there, I’ve met your supervisors and your area managers and I know that you are probably having a tough time. The PCS union really needs to address the factions within their union that are preventing positive change to take place. It’s a matter of urgency. People are dying. Today we were joined by many new members, some who had travelled a long way to join us. They had seen the film I, Daniel Blake and feel so moved that they want to help us to make changes. It was amazing, but I’m sorry that I wasn’t able to spend much time talking to you all, I was too busy. This has given me hope, I have more hope than I have before. But it’s hard work. To be fighting this battle for so long is tiring, both mentally and physically. But I won’t give up. It’s not an option. Please watch our video that we made with The guardian. Please donate if you can. This has sadly become a full time job for me and it’s hard work. It doesn’t just end on a Thursday after the demo. It’s ongoing. For everyone who has supported us, a massive thank you. For everyone who attends our demos or shares online a massive thank you. Sometimes I’m too busy to express my thanks enough. Saw the excellent Daniel Blake film today. The audience very moved by it, and shocked , particularly by the foodbank scene where the young woman is so hungry she just rips open the tin of beans and starts eating them with her fingers. It brings home the true reality of just what has been done to so many people. It really does. Amazing film.